When I have certain hot projects that I am working on, I like to have them close by in my office cubicle. I certainly understand the need for a drawer into which file folders are stored, but when it comes to current projects, I like to have them in my line of sight and easy to access. 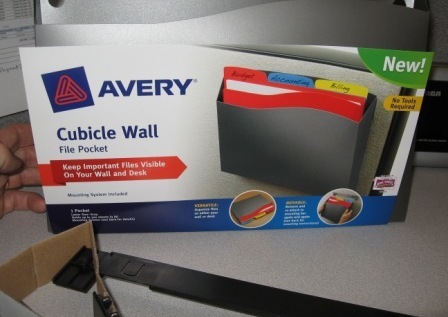 Before I purchased this Avery Cubicle Wall File Pocket, I used to place the manila folders with the project paperwork directly on my desktop. This would do the trick as far as visibility was concerned but it also cluttered up my desktop and you know how I feel about that! I've seen something similar in other offices near me but this one was so compact and didn't take up a lot of cubicle wall real estate. I could place many different file folders into this wall pocket but I usually only have about three or four in there because I really don't want to be working on too many different projects at one time. This unit acts as a constant reminder of my current projects and helps me stay on track when it comes to completing these tasks. If you‘ve been following this site for a while you know how I feel about utilizing my cubicle walls effectively in order to eliminate any clutter on my desktop. This article talks about using the many different types of cubicle shelves to enhance the storage capacity in your small office. 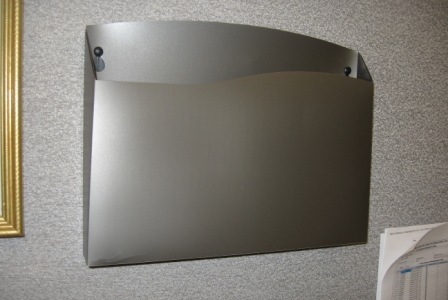 Well, this wall pocket is perfect for my needs and still gives me plenty of room on my cubicle walls to enhance my cubicle décor with picture frames and other personal photos and posters. 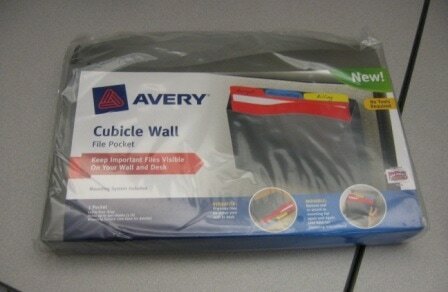 Avery Cubicle Wall File Pocket in package. 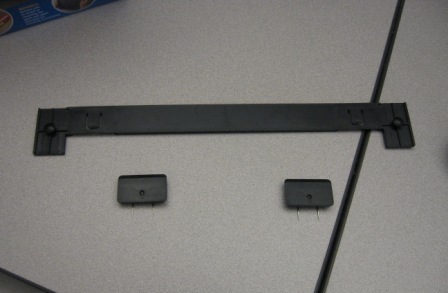 Bar for hanging and the pins which slide into the bar. Back of packaging with detailed directions for hanging. 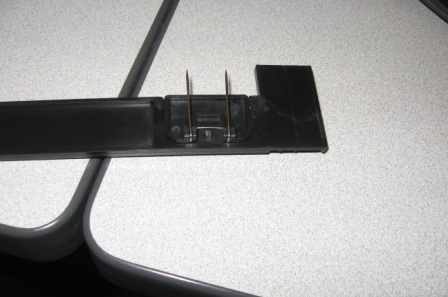 Pins slide securely into the bar on both sides. Front of packaging with hanging bar on my desktop. Pin slid fully into the hanging bar. 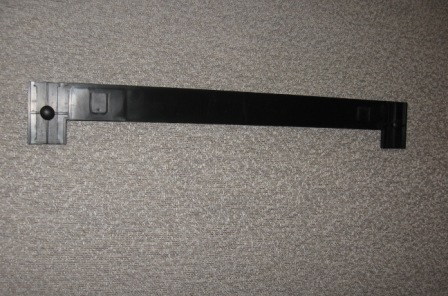 Same on other side. Hanging bar all ready to hang onto the fabric cubicle wall. 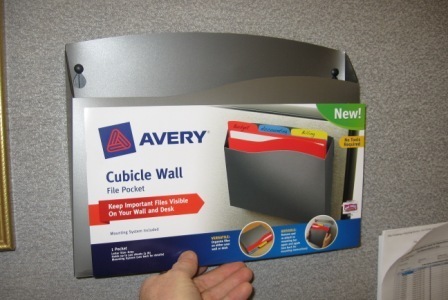 Cubicle wall pocket without the front packaging. Hanging bar hung on wall by sinking pins into the fabric. 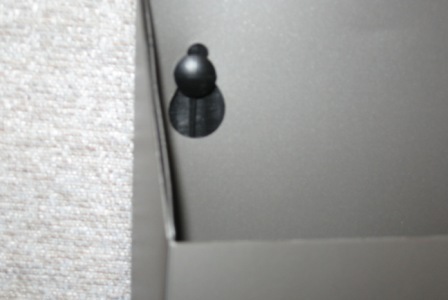 Closeup of how notches in wall pocket fit into pegs on hanging bar. 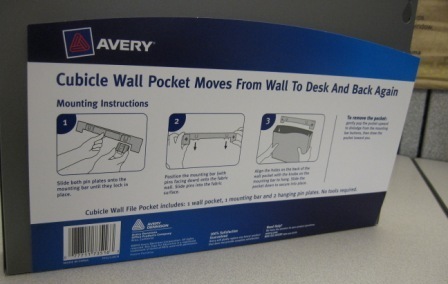 Avery Cubicle Wall File Pocket fits into pegs on hanging bar. 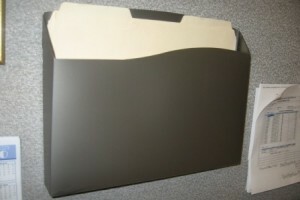 Hung on my cubicle wall with manila file folders. I've had this wall pocket only for a couple of weeks but I think it does exactly what I wanted it to do. It keeps my important and current project folders off of my desktop but in close enough proximity so that I am constantly reminded of the fact that I have to work on these projects now. 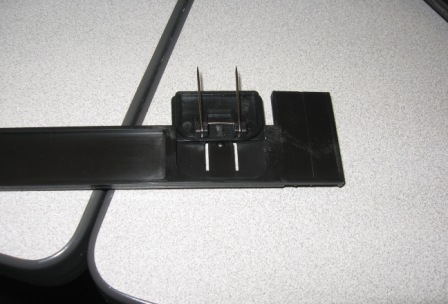 For a small amount of money this is a great solution for my office cubicle!